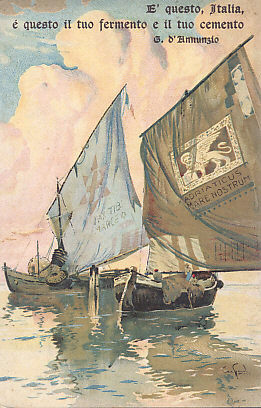 Two Venetian fishing ships meet, brilliant sails spread. On one, beneath Venice's Lion of St. Mark, the words "Adriaticus mare nostrum — the Adriatic, our sea." On the further blue sail, the cross and words "Pax tibi Marce [Evangelista meus] — Peace to you, Mark, my Evangelist." é questo il tuo fermento e il tuo cemento"
This is your ferment and your foundation.